This is an illustration of warbler. For decades, conservationists have considered blue-winged warblers to be a threat to golden-winged warblers, a species being considered for federal Endangered Species protection. Blue-winged warbler populations have declined 66 percent since 1968, according to the North American Breeding Bird Survey. The two species are known to frequently interbreed where they co-occur, and scientists have been concerned that the more numerous blue-winged warblers would genetically swamp the rarer golden-wing gene pool. New research from the Cornell Lab of Ornithology's Fuller Evolutionary Biology Program shows that, genetically speaking, blue-winged and golden-winged warblers are almost identical. Scientists behind the research say the main differences between the two species are in feather color and pattern, in some cases just a simple matter of dominant or recessive pairings of gene variants, or alleles. "We think we have finally pinpointed the proverbial genomic 'needle in the haystack' between these taxa," said study co-author David Toews, adding the findings suggest conservationists should be less concerned with hybridization and primarily focused on preserving habitat for both species. "This is something that conservation practitioners have wanted for a very long time." The research is published in the September issue of the journal Current Biology. Toews' collaborators include fellow Cornell Lab postdoctoral researcher Scott Taylor, along with partners from Cornell University's Department of Biological Statistics and Computational Biology, the University of California at Riverside and Environment and Climate Change Canada. The team investigated the genetic architecture behind the differences between the two warblers by analyzing the genomes of 10 golden-winged and 10 blue-winged warblers from New York, with birds sampled from the Sterling Forest along the New Jersey border to the St. Lawrence River Valley. Across their analysis of the entire genomes of both species, they found only six regions (or less than .03 percent) that showed strong differences. In other words, blue-winged and golden-winged warblers are 99.97 percent alike genetically. 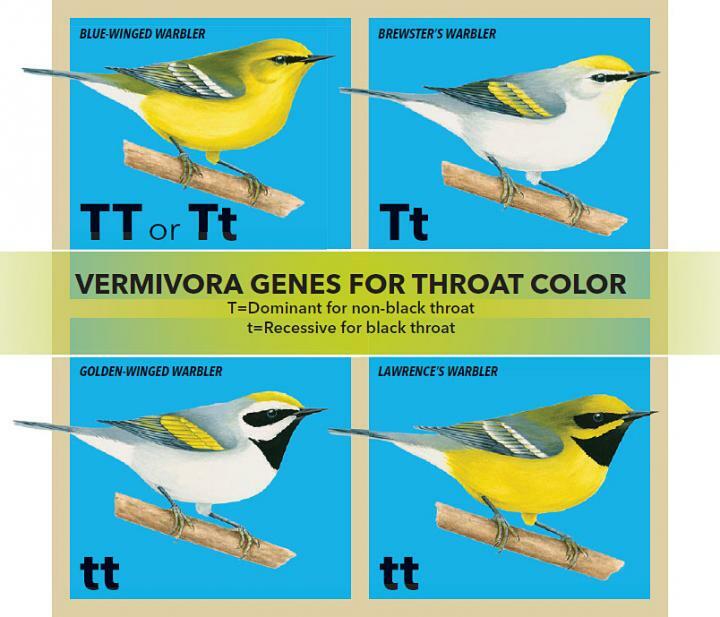 One of the differentiating regions has a gene that likely controls yellow/white versus black throat coloration; the black throat of the golden-winged warbler is a Mendellian recessive trait, occurring only in birds that have a pair of recessive alleles of this genetic variant. Another region likely controls body color; the yellow body of blue-winged warblers is likely an incompletely recessive trait. When blue-winged and golden-winged warblers interbreed, they produce various hybrids, including two forms called the Brewster's Warbler (with a light body and no black throat) and Lawrence's Warbler (with a yellow body and black throat). The new research shows the Brewster's form of golden- and blue-winged warbler hybrids seems to be an expression of dominant traits for throat and body color, whereas the Lawrence's form of hybrid exhibits recessive trait expression for both. The research supports a model, proposed by John T. Nichols of the American Museum of Natural History in 1908, that the Brewster's form of golden- and blue-winged warbler hybrids is an expression of dominant traits, and the Lawrence's form is a recessive-trait expression. Put another way, the striking visual differences between golden- and blue-winged warblers could be considered akin to the differences between humans with and without freckles. The research also shows golden-wings and blue-wings have even less genetic differentiation than two subspecies of the Swainson's Thrush, the olive-backed and russet-backed forms. Toews, Taylor and their collaborators also analyzed a subset of genetic regions from golden- and blue-winged warblers from across their range and found individuals from as far away as Manitoba and Missouri show similarly little genomic difference. This kind of genetic data carries information not only on how different the birds are today, but also on how long they might have been separated -- or interbreeding -- in the past. Going back 250 years to when golden-winged and blue-winged warblers were first scientifically described, they were known to live in different places, with golden-wings in the Northeast and upper Midwest and blue-wings in a band slightly farther south from the Ozarks to the Appalachian Mountains. And it was thought forest clearing by European settlers starting in the late 1700s caused the habitat changes that brought the two species together, causing their hybridization. In using the whole genome to look deeper into these birds' evolutionary histories, Taylor and Toews made a surprising discovery: These two species have probably been intermixing, at least intermittently, for thousands of years, well before Europeans colonized North America. "This hybridization has been considered our [humans'] fault," said Taylor. "But the propensity for these two species to hybridize is natural and appears to be part of their pre-European evolutionary history." Hybridization was one of the threats identified in the national Golden-winged Warbler Conservation Plan, published by a consortium of conservation groups and government agencies in 2012, though loss of young forest habitat was cited as the primary threat. Hybridization, and the question of human causation, may play a role in the U.S. Fish and Wildlife Service's upcoming decision on whether golden-winged warblers warrant federal protection under the Endangered Species Act. The matter of golden-wing/blue-wing genetic similarity may pose a tricky question for the American Ornithologists' Union, too, should its North American Classification Committee be asked to consider this evidence in a proposal to lump golden-wings and blue-wings into a single species. "Someone could definitely make a case for golden-winged warblers and blue-winged warblers being one polymorphic species. They are extremely similar," Taylor says. "From a conservation standpoint, they need comparable types of young forest habitat so we could treat them similarly, whether it's in the name of conserving one species or a complex of two closely related species." Page took 0.014786 seconds to load.